Antarctica is the 5th largest continent. It covers approximately 5.5 million square miles (14.2 million square kilometers); however, the actual size of the continent varies from month to month. It varies because the Antarctic Convergence, a strip of sea that marks the true edge of the continent, is always changing. The land itself is 98% covered by the Antarctic Ice Sheet. 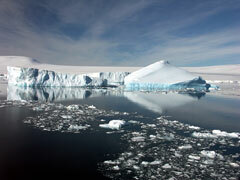 The ice sheet is an average of 1.6 miles (2.5 km.) thick and holds about 90% of the fresh water on Earth. Antarctica is surrounded by the Southern Ocean, which is also called the Antarctic Ocean. 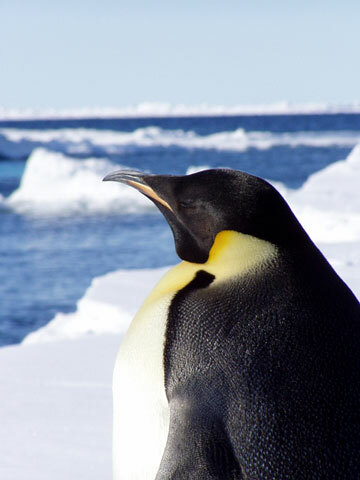 The continent is located at the South Pole and is the southernmost landmass. Antarctica is divided into two parts by the Transantarctic Mountains. These mountains run between the Ross Sea and the Weddell Sea and separate east from west. East Antarctica is higher in elevation. Here the ice and snow rises over 14,000 feet (4,267 m.). The interior of Antarctica is technically a desert since it receives little precipitation. Antarctica has an average elevation of about 7,500 ft. (2,300 m.). The highest point, standing at 16,050 ft. (4,892 m.), is the peak of Vinson Massif in the Ellsworth Mountain range. In contrast, the lowest point currently known is the Bentley Subglacial Trench. The trench is 8,200 ft. (2,499 m.) below sea level. However, the trench is covered by more than 9,840 ft. (3,000 m.) of ice and snow. There are two active volcanoes in Antarctica. They are Mount Erebus, which has a permanent lava lake, and Deception Island. Deception Island is just north of the Antarctic Peninsula and is a popular tourist destination because it is possible to have a warm bath in the volcanically heated water while sitting amongst the coldest snow and ice on the planet! While it may seem like there would be no bodies of water in Antarctica, it is actually home to more than 70 lakes. All of these lakes are covered by thousands of feet of ice. Lake Vostok is the largest of the lakes. It was discovered in 1996, beneath Russia's Vostok Station. Antarctica's nearest neighbor is South America (600 miles / 1000 kilometers away). The two continents are separated by the Drake Passage, the roughest stretch of open water in the world. Antarctica currently hosts an ever-rotating group of scientists who study the unique and pristine environment there. Large ships often venture near Antarctica to catch fish and squid. The only other people who visit Antarctica arrive on cruise ships. Since the 1960s, an ever increasing number of people have decided that the ideal vacation includes a tour of the Southern Ocean, with landings at outlying Antarctic islands or the peninsula that juts out from the continent. Antarctica has no permanent residents and, unlike all other continents, it has no native population. In fact, no one is known to have set eyes on Antarctica until 1820. Visit this map of Antarctica website for a more detailed Antarctica map as well as Antarctic travel information.